Carmel Academy recognizes the importance of athletics as an integral component of a student’s complete educational development. We believe that all students should have an opportunity to participate in some form of interscholastic athletics and that such participation should encourage positive scholastic, as well as social, growth and achievement. All participants and teams will represent the school and community in a positive manner and will reflect the dedication and hard work that will be required to compete and be successful. Carmel Academy realizes that an effective interscholastic athletic program is the product of responsible cooperation between its five major components: the student-athlete, the coaching staff, the parents, the teachers and administrative staff. The Carmel Academy Hawks have first-rate facilities for team practices and interscholastic competition, enhanced by our picturesque 17-acre campus in the heart of Greenwich, CT. The school has two fully-equipped gymnasiums, two playing fields, outdoor and indoor basketball facilities, and two outdoor tennis courts. Come Support the Carmel Hawks! 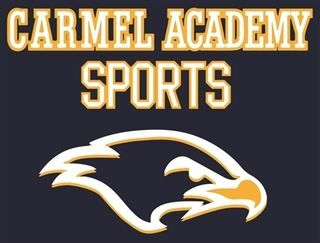 Carmel Academy is a member of the Fairchester Athletic Association, competing against private schools in Fairfield and Westchester Counties. Families and friends are always encouraged to cheer on our athletes at meets, games and practices. New England Thruway (I-95) to Exit 21 (marked White Plains, I-287, Port Chester, Rye). Bear right toward Midland Avenue. At the end of exit ramp, turn left onto Midland Avenue. Continue to the first light and turn right onto Peck Avenue. Continue to the end of Peck Avenue at light, and turn right onto Boston Post Road (Route 1). Turn left at the first light onto Cedar Street. South to Exit 26 (I-287 east, Port Chester, Rye). Follow signs to enter I-287 east. Take I-287 to Exit 11, Rye. Bear right at end of exit ramp onto Boston Post Road (Route 1). Continue past the playing fields. Entrance to the Admissions Office is a sharp right through the first opening in the white fence, just after the playing fields. For access to the campus, continue on Boston Post Road to the next light and turn right onto Cedar Street. Make next right onto Grandview Avenue. Parking lot is on the right. I-95 Exit 4 (Northbound turn right onto Indian Field Road, Southbound turn left onto Indian Field Road). Turn right onto Bruce Park Drive, follow to Park. From Merritt Parkway - Exit 30, going north (Route 120A, King Street): Turn left onto King Street. Follow 120A North; Exit 27 in Connecticut, going south (Route 120A, King Street): the exit is just after the gas station, go up the ramp and turn right onto King Street. School is approximately 3 miles up King St. on the left, just past Convent of the Sacred Heart, which is on the right. From Connecticut Turnpike (I-95) - Take 287 West to exit 9N (Hutchinson River Parkway/Merritt Parkway). Take Hutchinson River Parkway to Exit 30, King St. Turn left. Follow 120A north. School is approximately 3 miles on the left, just past Convent of the Sacred Heart, on your right. Turn left out of Carmel Academy and follow Lake Avenue North. Merritt Parkway (Rte. 15) South to Exit 27 – King Street. Bear right onto King Street and travel approximately two and a half miles. The School is on the right. New England Thruway (I-95)Take I-95 South to Exit 21/Interstate 287 West (just past the Connecticut/New York border). Continue on 287 West to Interstate 684 North. Continue on 684 North to Exit 2 (Westchester County Airport). Turn right and proceed toward the airport. Proceed straight at the traffic light. As you approach the airport you will come to a traffic circle. Proceed three quarters of the way around the circle, past the airport entrance, and make a right turn onto Rye Lake Avenue. Turn right at the next traffic light onto King Street. The School is on the left (7/10ths of a mile). Exit 30-King Street/120A. At the end of the exit ramp, turn left onto King Street. Travel approximately two and a half miles and the entrance to the School is on the right. Take I-95 North to Exit 21/Interstate 287 West (just before the Connecticut/New York border). Continue on 287 West to Interstate 684 North. Continue on 684 North to Exit 2 (Westchester County Airport). Turn right and proceed toward the airport. Proceed straight at the traffic light. As you approach the airport you will come to a traffic circle. Proceed three quarters of the way around the circle, past the airport entrance, and make a right turn onto Rye Lake Avenue. Turn right at the next traffic light onto King Street. The School is on the left (7/10ths of a mile). Take the Hutchinson River Parkway North to the Merritt parkway. Take the King Street (Greenwich) exit. Take a right turn off the ramp onto King Street. Continue to the traffic light and turn left onto Glenville Road. Follow Glenville Road through two stoplights in the village of Glenville. Continue on Glenville; pass a blinking yellow light. School entrance is approximately 100 yards on the left. Take Route 95 North to Connecticut Turnpike North. Take Exit 3 (Arch Street/Greenwich Hospital). Turn left off ramp; go under a railroad bridge to a traffic light. Continue straight through the intersection and take the first left up a steep hill (Soundview). Go to the end and turn right onto Field Point Road. Take the first left onto Brookside Drive. Continue on Brookside Drive through one traffic light and continue until you come to a stop sign. The entrance to Eagle Hill is diagonally across the street. Take the Merritt Parkway West. Take the Lake Avenue exit; turn right off exit and right again following sign pointing to Greenwich. Continue on Lake Avenue for about 5 miles. At the second rotary (large) follow around to the right and straight-ahead will be Glenville Road. Continue on Glenville Road for about 1/2 mile. Eagle Hill School is on the right at the bottom of the hill. Take Route 95 South. Take Exit 3 (Arch Street/Greenwich Hospital). Turn right off the ramp and go under a railroad bridge and up to a traffic light. Go straight through the intersection and take the first left up a steep hill (Soundview). Go to the end and turn right on to Field Point Road, then take the first left onto Brookside Drive. Continue on Brookside Drive through one traffic light, for about a mile, to a stop sign. The entrance to Eagle hill School is diagonally across the street. Get off Exit 44. Take right at light onto Congress. Continue straight to stop sign and take a left onto Burr St. Continue thru next stop sign (street turns into Mill Plain Road) and continue to Post Road (passing the Carleton Nursing Home on left and under thruway). Once you get to the Post Road, take a right (Al’s Place will be directly in front of you). Continue straight – when you pass Rory’s Restaurant on your right, look out for the Southport Brewing Company, which will be on your right and then bear right. At stop sign go straight under bridge. Continue straight to center of Southport. At stop sign bear left, keeping Driftwood Sandwich Shop on your right, onto Main St. School is about 1/10 of a mile down on right. Take the Merritt Parkway south (which becomes the Hutchinson River Parkway in New York State) south to New York Exit 23S (Mamaroneck). Turn right onto Mamaroneck Avenue. Make a right at a stoplight onto New Street (directly across from A&P). The School is on your right. Take I-95 South to Exit 18B (Mamaroneck). Merge onto Mamaroneck Avenue. Make a right at a stoplight onto New Street (directly across from A&P). The School is on your right. From the South (near I95): Take 95 North Take Exit 18 for Sherwood Island, and make a left off of the exit ramp. Follow to the second traffic light and turn right onto Greens Farms Road. Once you are on Greens Farms Road follow the above Westport directions to Greens Farms Academy. From the South (near the Merritt Parkway): Take the Merritt to Exit 42 for Westport/Weston and turn right at the bottom of the ramp. Follow through one traffic light and a stop sign. At the second stop sign, turn left onto Cross Highway and follow to Roseville Road. Turn right on Roseville Road and follow to the traffic light at the Post Road. Turn left onto the Post Road and follow the above directions from Westport to Greens Farms Academy. EXIT 4, Indian Field Road from New York or New Haven. From New York: Turn left onto Indian Field Road toward Route 1 over turnpike and Railroad Bridge. From New Haven: Turn right toward Route 1 over Railroad Bridge. Proceed 7/10 mile to traffic light; turn left onto East Putnam Avenue (Route 1). At 5th traffic light (approximately 9/10 mile - Second Congregational Church on hill) make a sharp right onto Maple Avenue. At stop sign in center of road, continue straight onto North Maple Avenue. Greenwich Academy is 100 yards on the left. Turn south toward the Greenwich Business District. Proceed 4 miles to intersection of North Street, Maple Avenue and North Maple, which is 1 mile beyond the only traffic light on North Street). Turn right onto North Maple Avenue. Greenwich Academy is 100 yards on the left. From Merritt/Hutchinson Parkway: Take Merritt Parkway Exit #31 marked North Street/Greenwich and follow signs for Greenwich Business District heading south (away from Bedford). Continue on North Street for approximately 2 miles. Greenwich Catholic School is located at 471 North Street on the right hand side behind St. Michael Church (modern wood church) at the corner of North Street and Clapboard Ridge Road. From I - 95/Connecticut Turnpike: Take Exit #4 marked Greenwich/Indian Field Road. Coming from New York City, take a left onto Indian Field Road after the exit ramp. Follow Indian Field Road straight until light at intersection with Post Road. Go straight through intersection, follow curve in road, and take first left, Stanwich Road. Continue on Stanwich Road and take left onto Fairfield Road, which curves around playing fields and goes under a pedestrian bridge. Follow up a hill and curve past Greenwich Country Day School entrance on your left, and bear right past intersection and triangle onto North Street. Continue on North Street for approximately 1 ½ miles and Greenwich Catholic School will be located on your left side after you see our soccer field. Take the second entrance (the first is an exit) by St. Michael Rectory and Church (modern wood church) and continue into parking area. From the Connecticut Thruway/Interstate 95, the Merritt or Hutchinson River Parkways, Take Route 287 Westbound. Turn off at Exit 1 for Tarrytown 119 and turn right (west) on 119. Approximately one-half mile down the road, turn right on Benedict Avenue, a road which forks up the hill. The school gate and sign are on the immediate right at the crest of the hill at the traffic light. Turn right and follow the campus map. From the Merritt Parkway to Route 104 North (Long Ridge Road) to Route 172. Left at light onto Route 172 West. Right onto Route 22 North at Bedford Village. Harvey is 7 miles north of Bedford Village on the right. From I-684 north: Take Exit 6 (“Katonah, Cross River and Route 35”). Turn right at traffic light at top of exit onto Route 35, then right on Route 22 South. Harvey is one mile on the left. * Right onto Edison Ave. Traveling South – Right off ramp onto High Ridge Road; left at next light onto Buxton Farms Road. Traveling North – Straight off ramp across High Ridge Road onto Buxton Farms Road. From Buxton Farms Road – Buxton Farms Road ends past shopping center; go right at stop sign onto Turn of River Road. Turn left at stop sign onto Intervale Road. This ends at Newfield Avenue. Go left onto Newfield Avenue. Turn left onto Intervale Road East to the South Campus Entrance. Follow the signs to the right for Admission Office/Simon House. Admission Office parking spaces are located in front of the building. Traveling East – Exit 8, Atlantic St. Turn left onto Atlantic St. at bottom of ramp. Go right onto Tresser Blvd. Go left onto Main St. (reads Elm Street on south side of intersection) and then bear right onto Grove Street. Traveling West – Exit 8, Elm Street. Go right onto Elm St. at bottom of ramp and follow Elm to Grove St.
From Grove Street – Grove St. becomes Strawberry Hill Avenue and Newfield Avenue. Turn onto Intervale Road East for the South Campus Entrance. Follow the signs to the right for the Admission Office/Simon House. Admission Office parking spaces are located in front of the building. Mill River Parkway.] Follow Saw Mill to Exit 17 (Dobbs Ferry/Ashford Avenue). Follow ramp; continue straight, merging with Ashford Avenue. Proceed on Ashford through 4 traffic lights. Take Exit 36 (Route 106/Old Stamford Road, New Canaan/Stamford). At traffic light at the end of ramp, turn left onto Route 106/Old Stamford Road. At the light, turn left onto Jelliff Mill Rd. Take Jelliff Mill Road one mile to the end and stop sign. Turn right onto Ponus Ridge. Continue 8/10 mile to stop sign. Turn right onto Frogtown Road. The school entrance is on your immediate left at the corner of Ponus Ridge and Frogtown Road. Route 15 North (Merritt Parkway) to Exit 40B. Travel North on Route 7 for approximately 6 miles. At the junction of Route 7 and Route 33, turn left onto Route 7/Route 33 North. Continue for approximately one half mile to Our Lady of Fatima Church at 229 Danbury Road, on the left, across from the Wilton Historical Society. I-95 North to Exit 15 (Norwalk, CT). Keep left onto Route 7 North connector. At the end of the Route 7 connector turn right at the traffic light. Turn left at the next traffic light and continue on Route 7 North. In five miles at the junction of Route 7 and Route 33, turn left onto Route7/Route 33 North. Continue for approximately one half mile to Our Lady of Fatima Church at 229 Danbury Road, on the left, across from the Wilton Historical Society. From I-95 north and South, exit 19 Playland Parkway, turn left onto Milton Rd. Resurrection is on left side after Rye High School. Exit 39B, Route 7 Connector. The connector will end turn left at the end. At the stop, sign; turn right onto Belden Hill Road. Follow until a traffic light, which is at the intersection with Route 33. Turn left onto Route 33 North. Follow 33 N into Ridgefield, where it will become Main Street. At the second traffic light, turn left onto Catoonah Street. At stop sign turn right on High Ridge Avenue. At stop sign turn left onto Barry Avenue. Follow Barry Avenue 2.3 miles (Barry Avenue turns into West Mountain Road). Ridgefield Academy is on the left. Follow drive to the upper parking lot. Route I-95 to Exit 15, the Route 7 Connector. The connector will end turn left at the end. At the stop sign, turn right onto Belden Hill Road. Follow until a traffic light, which is at the intersection with Route 33. Take a left onto Route 33 North. Follow 33 N into Ridgefield, where it will become Main Street. At the second traffic light, turn left onto Catoonah Street. At the stop sign turn right onto High Ridge Avenue. At stop sign turn left onto Barry Avenue. Follow Barry Avenue 2.3 miles (Barry Avenue turns into West Mountain Road). Ridgefield Academy is on the left. Follow drive to the upper parking lot. From north or south bound, take Exit 4/Route 172. Turn east on Route 172 and travel 1.6 miles to Route 22. Turn left/north on Route 22. Travel approximately 2 miles on Route 22 north to the school. The school is approximately 1 mile north of the Village of Bedford. Take Merritt Parkway to exit 31 north St, Turn right off Northbound and left off Southbound onto North St. NORTH ST becomes BEDFORD BANKSVILLE RD. Turn LEFT onto MIDDLE PATENT RD. Turn RIGHT onto NY-22. Turn SLIGHT LEFT onto NY-22/OLD POST RD. Follow road and turn RIGHT onto CANTITOE ST/NY-22. Exit 15, Norwalk, Danbury. Follow to connector. Stay on connector to Exit 2. At the end of the exit ramp there is a light, turn right and go back under the connector. Go through the first set of lights and at the second set of lights (Wendy's in front of you), take a right onto Route 123 North (Riverside Ave.). Follow Route 123 approx. 6 miles (Riverside becomes Smith Ridge Road). Go past golf course on left to a fork in the road (also marked with a "Deer Crossing" sign). You’ll know that you’ve gone too far if you come to a sign saying "Welcome to New York". Bear right at that fork onto North Wilton Road and follow to the end. At stop sign, turn left. St. Luke’s is 2/10ths of a mile up on the right hand side. Look for football field or sign with "St. Luke’s" inscribed on it. Follow driveway up hill to traffic circle and park anywhere. Take exit 38. From northbound Merritt, go right at end of exit. From southbound Merritt, go left at end of exit. Continue on Route 123 North approx. 6 miles. Go past golf course on left to a fork in the road (also marked with a "Deer Crossing" sign). You’ll know that you’ve gone too far if you come to a sign saying "Welcome to New York". Bear right at that fork onto North Wilton Road and follow to the end. At stop sign, turn left. St. Luke’s is 2/10ths of a mile up on the right hand side. Look for football field or sign with "St. Luke’s" inscribed on it. Follow driveway up hill to traffic circle and park anywhere. From the MERRITT PKWY north. Take the CT-124 exit, EXIT 37, toward NEW CANAAN/DARIEN. Turn LEFT onto SOUTH AVE/CT-124. The Stanwich School Junior House (Grades 7-8) is located at the former Sacred Heart Academy in Stamford, Connecticut. The campus is in a residential area, one block from the Tully Health Center. If you are traveling from an area that is not listed below, please call the Stamford Campus at 203.542.0001 for directions. Take Exit 8 (Atlantic Street). Turn left at Atlantic Street and continue onto Bedford Street. Turn right at 5th Street and turn right at the traffic light onto Strawberry Hill Avenue. The campus will be immediately on your right. Take Exit 9 (Glenbrook Road). Turn right onto E Main Street/US-1. Take a slight right at Broad Street and turn right at Grove Street, which turns into Strawberry Hill Avenue. The campus will be on your left. Take Exit 34 (Long Ridge Road). At the end of the ramp, turn right onto Long Ridge Road and continue for 2 miles. Turn right onto Summer Street and then left onto 5th street. Turn right at the traffic light onto Strawberry Hill Avenue. The campus will be immediately on your right. Take Exit 35 (High Ridge Road). At the end of the ramp, turn right onto High Ridge Road and continue for 2 miles. Continue straight onto Summer Street and then left onto 5th street. Turn right at the traffic light onto Strawberry Hill Avenue. The campus will be immediately on your right. * Follow Rte.59 South for 2 miles through the intersection of Fairfield Woods Road (Mobil Station). Unquowa is on right behind white fence. ** Follow for 1.4 miles (Kings Highway becomes North Avenue). Turn left onto Rte.59 (Brooklawn Avenue). Follow Rte.59 (Brooklawn Avenue becomes Stratfield Road) for 1.5 miles. Unquowa is on left behind white fence. Take I-95 North or South to Exit 15 - Route 7/Danbury - and follow to the end of the connector (approximately 2-3 miles). Turn right at the light. At the second traffic light (in front of the DMV) make a left on to Route 7 North. Travel approximately two miles, and turn right on Grumman Hill Road. Proceed up the hill to the first stop sign and turn right onto Whipple Road. Proceed one-quarter mile and the school will be on your left. Take Rt. 15 North or South to Exit 39B - Route 7 North/Danbury - and follow directions below. Merge from exit ramp onto Route 7 North and travel approximately 2 miles - passing the DMV. Travel approximately two miles, and turn right on Grumman Hill Road. Proceed up the hill to the first stop sign and turn right onto Whipple Road. Proceed one-quarter mile and the school will be on your left. Exit 26W - 287 West, White Plains. Proceed on service road (Westchester Avenue) for approximately 50 yards to Red Oak Lane. Turn right at the stop sign onto West Red Oak Lane. Entrance to Windward School is approximately 1/4 mile on left. Exit 26W - 287 West, White Plains. Stay in right lane to immediately turn right to Red Oak Lane. Turn right at the stop sign onto West Red Oak Lane. Entrance to Windward School is approximately 1/4 mile on the left. Exit 9 N-S - Hutchinson River and Merritt Parkways. Proceed on the service road (Westchester Avenue) through one traffic light. Immediately past the entrances to the Hutchinson and Merritt Parkways, turn right to Red Oak Lane. Turn right at the stop sign onto West Red Oak Lane. Entrance to Windward School is approximately 1/4 mile on the left.